Simon works second shift and I work in the mornings until he has to go to work. This means we spend a whole lot of time with our kids on our own (they do go to daycare one day a week so Simon can get things done around the house, a.k.a., sleep) and we need to entertain them. I’m all for letting kids entertain themselves but that doesn’t always work and it also doesn’t help with expending energy or a change of scenery. But a treadmill seems a bit dangerous considering Jack, and often Liam, still runs into walls; large, stationary walls that have been there all their lives. I’d imagine having to explain treadmill burns would grow a bit tedious very quickly. 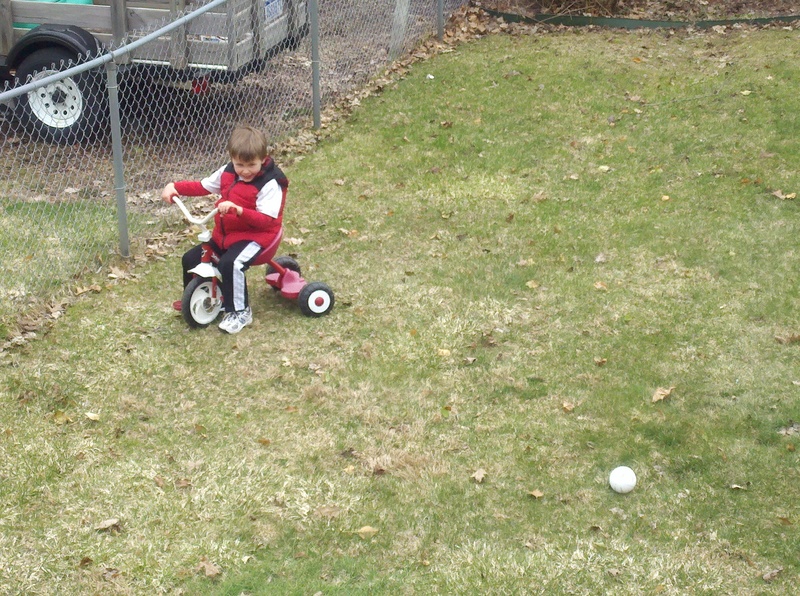 But the boys still need to run, see: endless amounts of energy. So we leave the house. Mostly we go to parks. 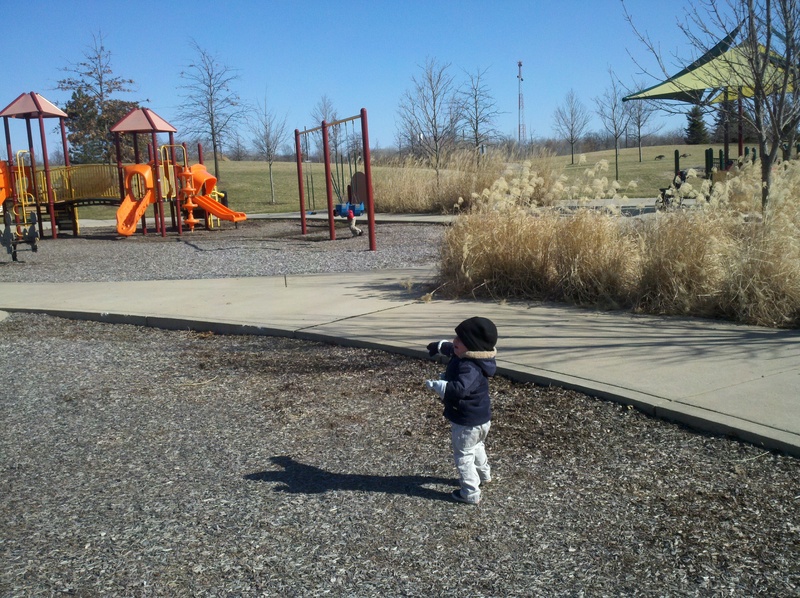 As long as it’s reasonably warm and/or sunny, we try to get outside. Sometimes this means going while it still cold enough to require winter clothing, but as long as there’s no snow or mud, we’ll go. We take what we can get in Michigan. Often we meet up with friends so the moms can chat while the kids run around. 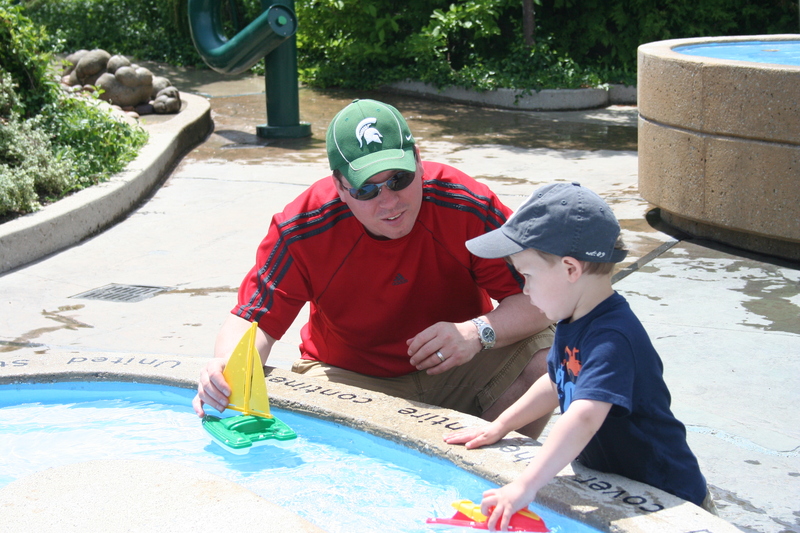 Our favorite park is Frog Hollow – it’s entirely fenced in, except the entrance and the play equipment is strategically placed away from that entrance. 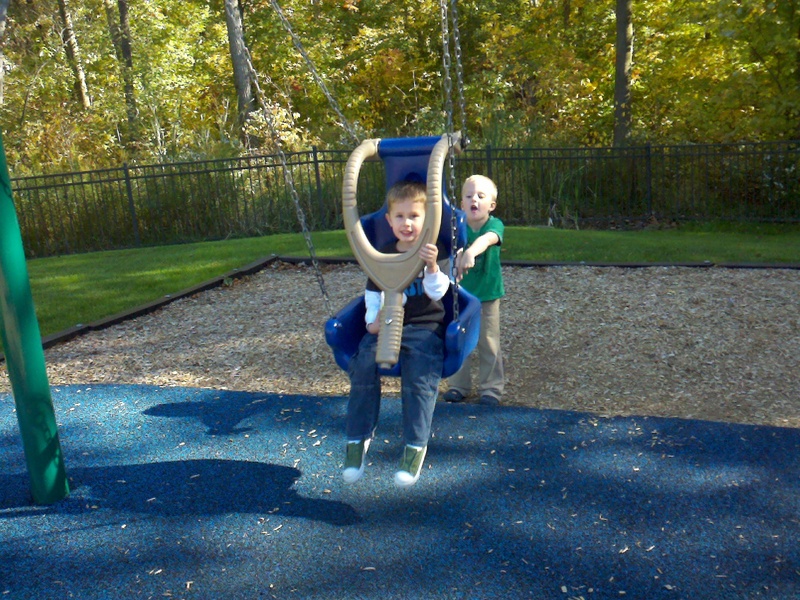 The ground is woodchips or padded outdoor material and there are bathrooms – both key for small children. As an added bonus, there’s a Sonic between the highway exit and the park so we plan our trips to coincide with “happy hour” and get away with slushies for the whole family for $3! Win-win! Sometimes we just stay in our backyard, while it’s not the most fun, it’s preferred to staying inside. Though we avoid the hour between 2 and 3 when the potty-mouthed high schoolers are walking home after school (kids these days). Liam would be bound to pick up bad language, plus he yells “Hello” at anyone who walks by and then George has to lose his mind barking. It’s much better if we stay inside at that time. This winter Simon spent a lot of time during his mornings with them at the new mall (Rivertown) and the old mall (Center Point) at the play places. [Side note: Rivertown is at least 10 years old and we still call it the “new” mall and now our kids call it that even though they have no idea there was a time before the malls.] 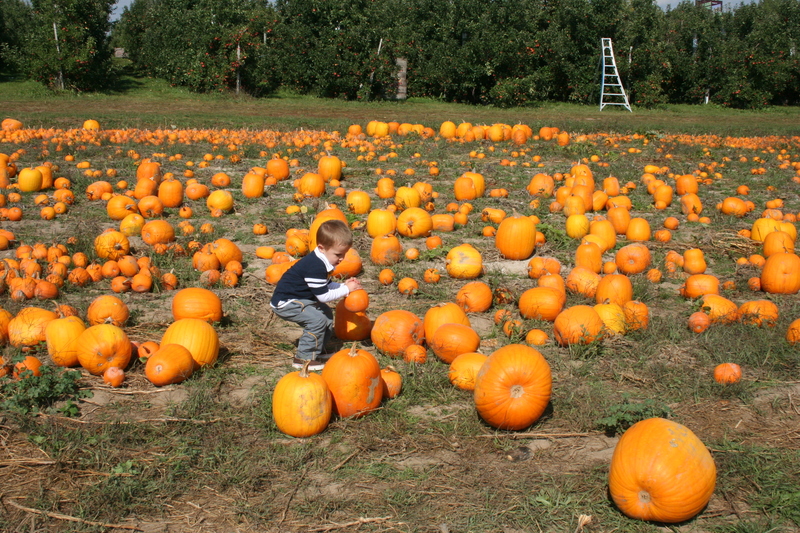 I opt to take them to Meijer or Costco for our outings – plus plenty of playdates. Costco is great because we get dinner with a smoothie and samples and split a piece of pizza for us all and get our bulk purchasing done. Whoot! 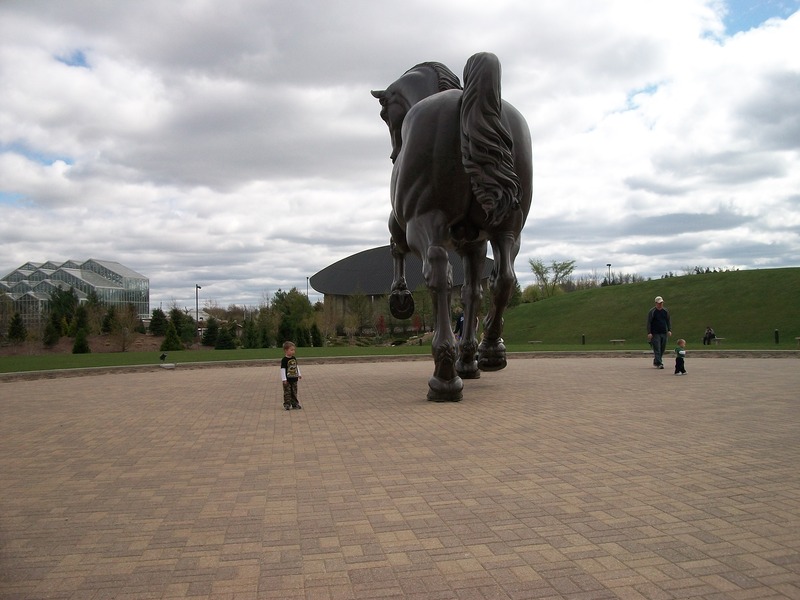 Another favorite is Meijer Gardens to see the butterflies, run around the children’s garden, float boats around the Great Lakes and visit our favorite ginormous horse. 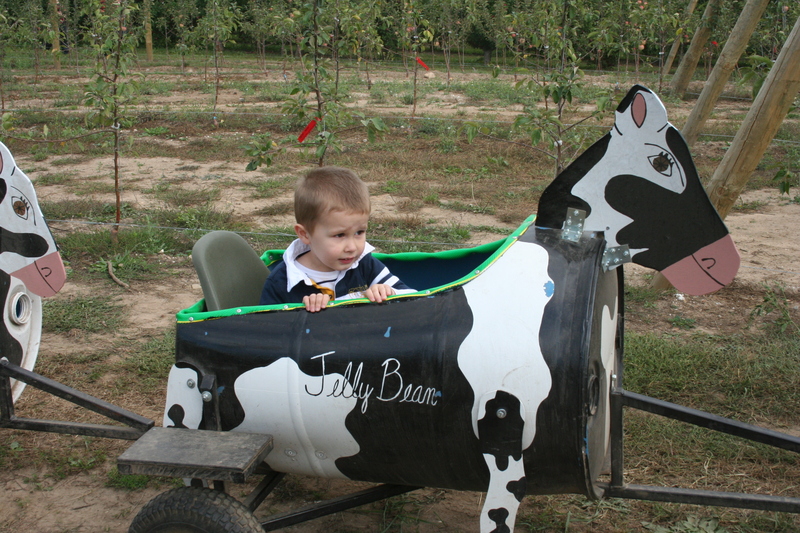 And then in the summer and fall we’ll get to go to Schwallier’s Country Basket which is our favorite apple orchard for kids. It’s all free except the cow train and paying for feed for the goats (and the mandatory fresh donuts and cider). 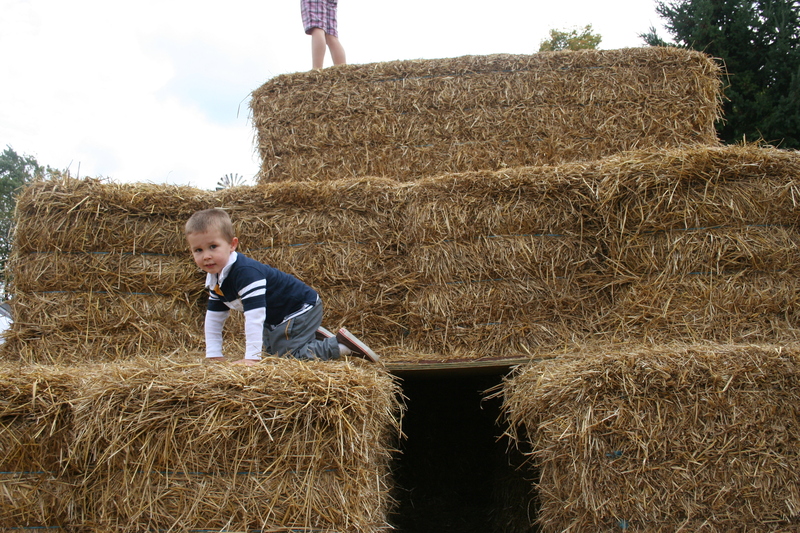 But there are tons of animals to pet and look at, apple orchards for running through and a great play area for kids with a barn slide and corn box (think sandbox with dried corn). Gotta do something to pass the time… it works for us! How did you get those cool picture grids? And I have never heard of Frog Hollow, which I kind of feel like you were holding out on me :), and I still call it the new mall, too. Is it really 10 years old?!?! The girds were done by trial and error, resizing the images and no text wrapping so they go side-by-side (I know enough coding to be dangerous). Not holding out – it’s just a long way to drive for my Forest Hills friends 😉 – it’s over behind Metro Hospital and Byron Center and M6, about 10-15 minutes for us to get to down 131. 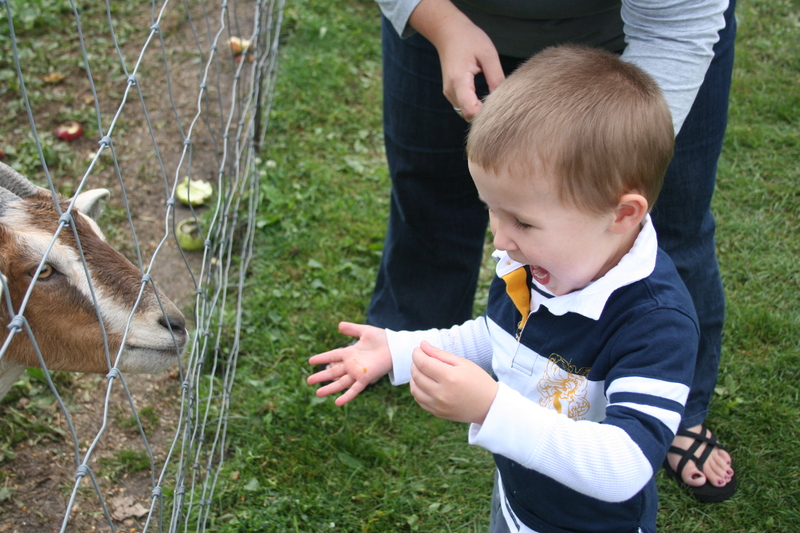 Next time you visit – let’s make a trip over… it’s worth it for Sonic and fenced in kids. We love Frog Hollow too! Play date soon? Absolutely! Next week is crazy but the week after that would be perfecto!